Our biggest sales event of the year starts today! That's right, it's Sale-a-Bration! What does that mean? It means that YOU get to earn FREE stuff. Yep, there are 3 ways you can take advantage of getting MORE during Sale-a-Bration. First, with every $60 order (before tax/shpg), you get to pick FREE exclusive product from our Sale-a-Bration catalog. That means if your order is $120, you get to pick 2 FREE items, $180 = 3 FREE items, and so forth. 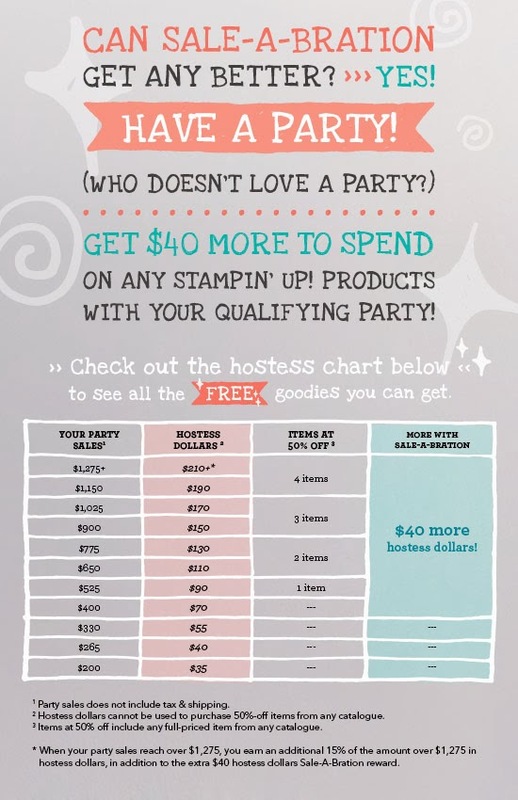 Second, host a party during Sale-a-Bration and when your party sales reach $400 (which is the Canadian party average), you'll get $40 MORE FREE stuff! Yep, that means when your party reaches $400, you're going to earn $110 FREE to spend on anything in our current catalogs! 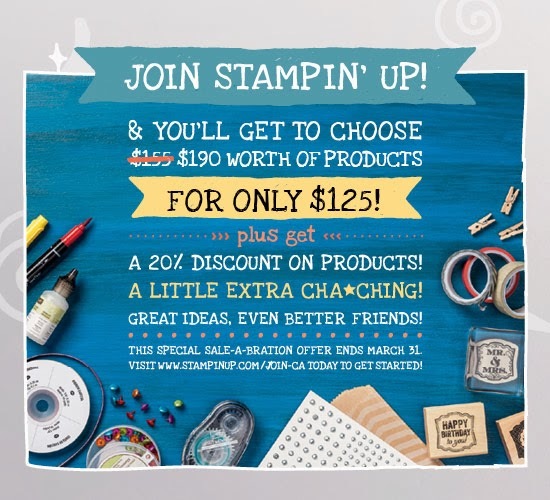 Lastly, you can join my Stampin' Up! team during Sale-a-Bration and get MORE product in your starter kit. You'll get $190 worth of product YOU CHOOSE for only $125! So who's ready to Sale-a-Brate? I know I am! 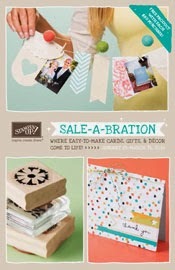 Be sure to check out my blog for ideas using products from the Sale-a-Bration catalog. If you have any questions about becoming a Demonstrator, please feel free to contact me. There's never been a better time to join; even if you're only doing it for the discount ;c).